Decent sized increases in the commercial and the matchday revenue. For matchday I assume the Champions League run meant we did have more home games than the season before. Club still hugely dependent, obviously, on that £70M+ from that Champions League run and the £150M from the Premier League tv deal. Once you are in the Champions League you need to be in again - year after year. Club wide wage bill of £260M though. Crackers that. LFC have just reported gross profits of £125m for the last financial year which is the largest annual profit ever recorded by a football club. This is a phenomenal turnaround from the desperate days of H & G. Reaching the CL final was worth £72m in revenue compared to Real Madrid’s £78m.Total revenue amounted to £455m. Liverpool has posted the largest annual profit ever recorded by a football club, after a stellar run to the Champions League final and blockbuster player sales provided an unexpected boost to its financial performance. Revenue at the English Premier League side, currently mounting a strong challenge to win its first league title in 29 years, was £455m in the year to May 31 2018, a period that covers last season. Liverpool also made a pre-tax profit of £125m, up £85m from a year earlier. The figure beats the £92.5m profit achieved by Leicester City in 2016/17, the season the Midlands club played in the Champions League, European football’s most prestigious competition, following its unlikely Premier League victory in 2016. Liverpool has closed the gap on the sport’s financial elite, which includes Spain’s Real Madrid and Barcelona, England’s Manchester United and Germany’s Bayern Munich. However, each of those clubs still made at least £100m more in revenues than Liverpool last season, according to figures collated by Deloitte, the consultancy. “What we have seen is a stable and sustained improvement in the club’s financial position over recent years,” said Andy Hughes, Liverpool’s chief operating officer. Liverpool’s run to the Champions League final last May, when it was defeated by Real Madrid, provided extra income from broadcasters, ticketing and prize money. Media revenues were £220m, up by £66m from a year earlier. Commercial revenues, such as from sponsorship contracts, were £154m, an increase of £17m. Match day revenues also increased to £81m, up £7m. Over its financial year, Liverpool made a £124m profit in player trading, in part through the sale of Brazilian midfielder Philippe Coutinho to Barcelona for a reported £142m. In most transfers, fees are paid in instalments, meaning income from the Coutinho transfer will probably be realised over a number of years. Does anyone know how this compares to the other big clubs in Europe? This was the most recent comparison so not sure if we have overtaken Chelsea. 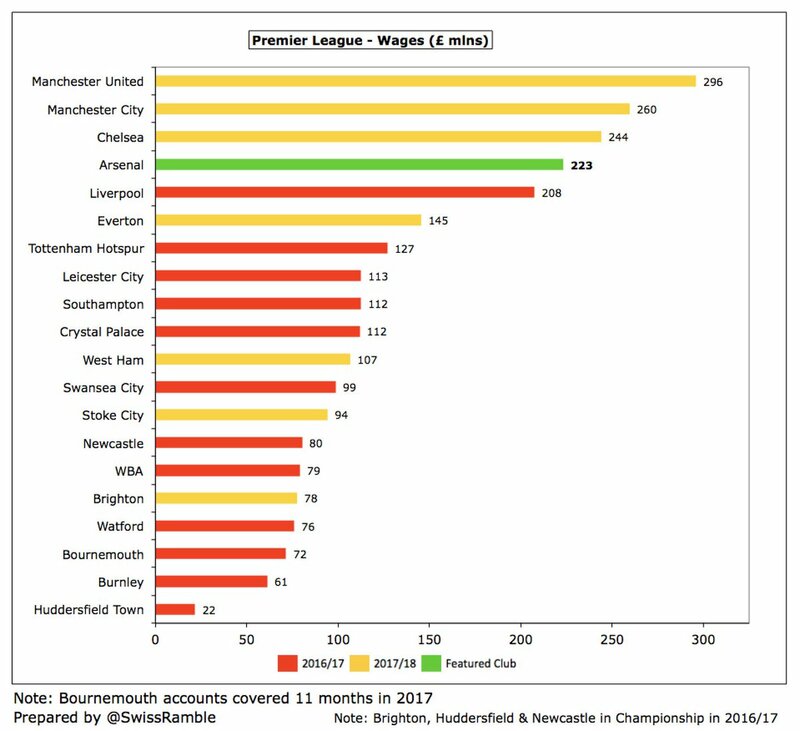 Correct me if I am wrong, but isn't City's wage bill higher in the footballing department (players, coaches etc), where as the reason why our wage bill is higher overall is because we are paying full living wages to the normal staff? Don’t they have their wages structured in some way to get around FFP? Think their big dodge is commercial revenue which is about £80M more than Liverpool. Yeah right! Love to see the breakdown of that. At least Billy Hogan doesnt go round scraping any old sponsor deal from the bottom of the barrel .... like coffee percolators FFS... and also in contrast to the Scum we seriously invest in the stadium infrastructure including with the stand and work having commenced over at Kirkby. * Good Reggae album by the same name chaps and chapsesses. Liverpool FC's record-breaking accounts showed that the club's wage bill rocketed by 26.4% to £263million. For the 12 months to the end of May 2018, the Reds spent around 57.8% of their £455million turnover on salaries. That hefty increase led to reports that Liverpool had leapfrogged Manchester City (£260million) into second place behind Manchester United (£296million) in the table of Premier League wages. However, those claims don't stand up to scrutiny when you look at the figures. The reality is that it's not comparing like for like. Liverpool currently employ in excess of 800 staff across the club's different departments who are all included in the latest set of accounts. In contrast, City's annual wage bill of £260million only includes 449 members of staff - 210 on the football side and 239 in commercial and administration. That figure is much lower than Liverpool's because elements of City's business are outsourced. It's also understood that a number of significant salaries at City are paid by the City Football Group, the holding company that administers all the global clubs under the ownership of Abu Dhabi United Group. Back in November, German magazine Der Spiegel alleged that City had previously sought to circumvent UEFA Financial Fair Play (FFP) rules by secretly setting up a shell company to pay players for their image rights. They claimed that it took millions of pounds off the City wage bill and enabled the club to announce a £26million boost in income for selling the marketing rights.City dismissed the allegations as an “organised and clear” attempt to damage their reputation. The 26.4% leap in Liverpool's wage bill from £208million to £263million for the 12 months to May 2018 is partly explained by the signings of Mohamed Salah, Virgil van Dijk, Andy Robertson and Alex Oxlade-Chamberlain during that period. he big increase in expenditure on salaries by owners Fenway Sports Group is designed to ensure that Liverpool not only attract but also retain the best talent in world football. The rise in the Reds' wage bill is in line with the increase in overall club revenues, which climbed by 25% from £364million to £455million. Of the three main revenue streams, media increased by £66million to £220million, commercial was up by £17million to £154million and matchday received a £7million boost to £81million as Liverpool recorded a pre-tax profit of £125million (£106million after tax). Brilliant album and first listened to in Ocho Rios Jamaica when Gilbert hit the island. Yes I know. Poser ......but if you did it ......flaunt it. My mate lived and worked in Kingston, Jamaica in early 90s. Said he knew it was time to come home when he had visitors over to visit and was dropping them back at the hotel. Stopped at lights he heard what he thought was the car behind backfiring followed by a couple of mopeds scooting away. Lights changed and he dropped off guests and on the way back the whole junction was cordoned off. 3 dead - one a kid on a bike nearby - in a drugs / gangland thing. Says no bereavement in his personal life ever affected him as much as the aftermath of that.......just the randomness. Other than that he says it’s the best place he’s ever lived. I ran a big company and had two holidays in 88 and 89 there at The Jamaica Inn. The first one we arrived the day just before Hurricane Gilbert hit the island. That week was totally surreal cut off from the rest of the world living in paradise with no leccy to the hotel . Could write a book on it. You just don't out with bling on ... you're asking for it. I got on well with most of the bruthers they were cool. Always keep them to the front of you if there is more than one. Think the worst was being stuck in Mobay ( Montego Bay) in the rush hour with seemingly every heavy Jamaican peering into the car in the packed streets. It certainly was the front line and doors locked in the car. Met a rasta called " MeAlone" lived under an upturned rowing boat in a small bay right next to GoldenEye. Favourite Track reminds me also of Jamaica ...is Massive Attack's Girl I Love You when it mentions Spanish Town. Every Christmas I get something special. A bag of Jamaican Blue Mountain coffee. Google it. Wikipedia it. Its something else. Now what was the topic again ?